African-Americans disproportionately face challenges when it comes to transportation access, costs, and safety. 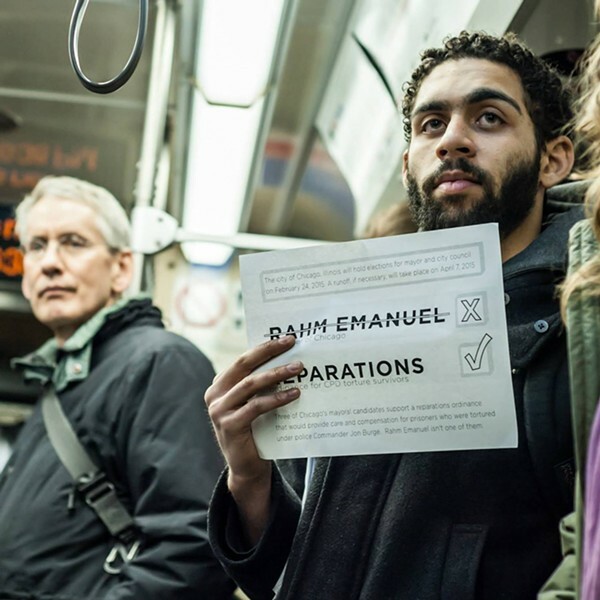 Sarah-Ji Photography Jason Ware campaigns against Rahm Emanuel on the el. When it comes to improving Chicago transportation, city officials and advocates often focus on infrastructure, reasoning that street redesigns, public transit improvements, and better pedestrian and bike facilities will help make travel safer and more convenient for all residents. But decision makers sometimes overlook issues that are specific to Chicago's lower-income communities of color on the south and west sides. Many of these areas have poor mass transit service, unsafe conditions for walking, and limited or no access to bikeways and Divvy stations. Transportation costs that may seem trivial to higher-income residents, like the price of a CTA ride or a traffic ticket, can be significant for poor and working-class people. And street crime and police harassment—problems that disproportionately affect African-American and Latino Chicagoans—can be major factors in their travel decisions. Carruthers, 31, was born and raised on the south side and currently lives in Bronzeville. 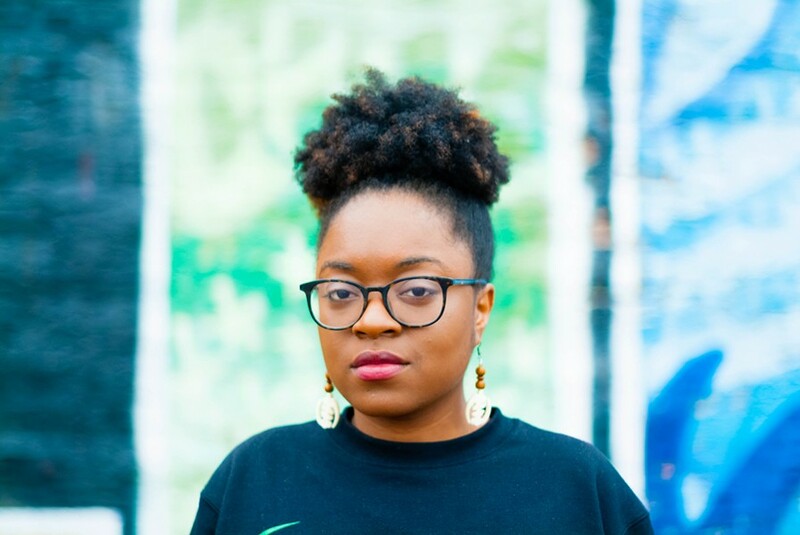 Her organization, made up of African-Americans ages 18 to 35, addresses issues like police abuse, mass incarceration, and LGBT and women's rights "using a Black queer feminist lens." Ware, 21, grew up in Rochester, New York, and now lives in the Austin neighborhood, where he runs a restorative justice program at Austin College and Career Academy. #LetUsBreathe was formed as a fund-raising initiative to provide aid to Ferguson protesters. The group uses civil disobedience, as well as outreach through various art forms, to call for police and prison abolition. 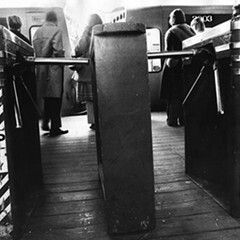 "I do believe transportation access is an element of social justice," Carruthers says. For starters, as noted in this column in the past, large segments of the south and west sides lack good access to the el system. That directly affects some of her group's members, who have to make multiple CTA transfers to access downtown meetings. "Meanwhile, we know that public transportation is often concentrated in areas where economically advantaged people live," she says. "That makes it harder for low-income people to access jobs, school, and activities." Limited CTA service hours can also be a problem in underserved communities, notes Ware. "While the Red and Blue Lines run 24 hours, the Green Line, and especially the Pink Line, stop running very early," he says. "That makes it hard for people in Little Village and North Lawndale to get places at night." Being forced to wait for transit for long stretches, or encountering bus stops with no seating become "questions of dignity" for African-Americans, Carruthers says. Both activists also highlighted public transit problems specific to African-American teens. Chicago Public Schools students, around 38 percent of whom are black, are issued reduced-fare cards that get them on CTA buses and trains for $0.75 (plus $0.15 for transfers). Ware and Carruthers say they've witnessed and/or heard about incidents in which black teens who didn't have a reduced-fare card or student ID with them were barred from taking advantage of the discount, even though some of these students were wearing school uniforms at the time. In a statement, CTA spokesman Jeff Tolman said that if a child who looks to be of elementary age doesn't have a student fare card or ID with them, the bus driver or customer assistant can let them pay the reduced fare, but he indicated that teens who lack these items are required to pay full price. However, Tolman also said that there haven't been enough reported incidents of teens trying get the discount without the proper fare card or ID to suggest that this is a routine problem. Still, Ware argues that this issue could be avoided if the CTA just gave free fare to CPS students. The cost of transit can be significant for these students, Ware says. Even the reduced CPS fare can total a few hundred dollars a school year, and it's not uncommon for students to ask him to tap his Ventra card to get them into the system, he says. "It could have a lot of impact if the city just gave every CPS student free fare," he says. "Students who are pinching pennies for the CTA might [also] have problems paying for uniforms and school supplies." Along with problems with el and bus service, many residents of lower-income communities have little or no access to bike lanes, paths, and bike share, even with Divvy's recent south- and west-side expansion. "There's not as many [bike-share] stations in black and Latino neighborhoods," Ware says. However, he praises the city's Divvy for Everyone equity initiative, which offers $5 annual memberships to individuals making less than $35,310 a year, saying, "We need more programs like that." On the other hand, Ware says, poor and working-class residents may view new bike lanes and transit stations in their neighborhoods as harbingers of gentrification that could force them from their homes. For example, he notes that the $203 million revamp of the Wilson Red Line stop will make economically diverse Uptown more attractive to higher-income folks who want easy rail access to their downtown offices. Carruthers argues that it's important for the city make sure that black and brown communities are on board before reconfiguring streets to make room for bike lanes. 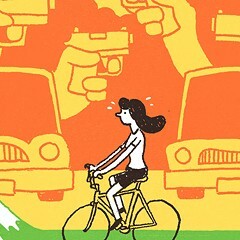 "You have to ask, who wanted the bike lane—was it the neighborhood or just city officials making plans for newcomers?" she says. "Black people ride bikes too. But bike lanes, like new coffee shops, can be seen as markers of gentrification, so I think people have a right to be concerned." The city's transportation department generally does seek input and approval from local stakeholders before making major roadway changes. 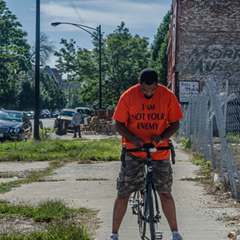 But in the past, opposition from neighborhood leaders and/or residents threw a wrench in plans for new bikeways on King Drive in Bronzeville, Division Street in Humboldt Park, and Independence Boulevard in West Garfield Park. Some transportation advocates and community activists might disagree about whether these cases were missed opportunities to improve safety, or examples of the city yielding to the will of the community. Likewise, Carruthers and Ware say the city should proceed with caution when implementing its Vision Zero plan, slated for release this fall. That document will lay out a strategy to eliminate all Chicago traffic fatalities by 2026 through engineering, education, and enforcement. "How do we make sure the enforcement doesn't disproportionately affect communities of color?" Carruthers asks. "There are already more police in these communities than other parts of the city, and the mayor is hiring hundreds more officers," Carruthers says. "Giving more resources to the police does not make brown and black neighborhoods safer—investments in education, jobs, and mental health do." Chicago Department of Transportation spokesman Mike Claffey has said Vision Zero efforts will, in fact, be concentrated in the neighborhoods that are disproportionately impacted by severe crashes, largely lower-income neighborhoods on the south and west sides. 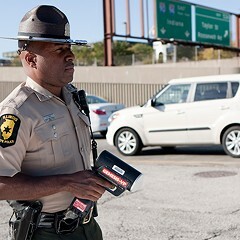 Transportation advocates have argued that well-run traffic camera programs not only reduce crashes and fatalities but also address the problem of racially biased enforcement by officers. Still, Ware isn't a fan. "I hate the cameras, personally and politically," he says, arguing that Chicago's $100 fines for running red lights or speeding by 11 mph over the limit are an unreasonable burden on lower-income people. He did warm up to the idea of sliding-scale traffic tickets, with penalties based on income, a concept I've discussed in this column. "That sounds like a great idea," he says. Another equity strategy would be diversionary programs, where drivers have the option of attending traffic school as an alternative to fines, which could help prevent future violations. However, Carruthers notes that it might be difficult for hourly and shift workers to take advantage of this. But beyond public transit and biking, from talking to these two activists, it sounds like the biggest discrepancies in the way white folks and people of color experience transportation and public space may occur when they're pedestrians. Ware said his students' route decisions are shaped by gang territory borders, and they might avoid standing on certain corners to avoid being confronted by police. "There are places I will avoid if I know there will be a lot of police there, because of their unpredictability," says Carruthers. For example, she says, the fact that officers frequent the area around her local Green Line stop discourages her from riding the train. "I'm fortunate because I drive nowadays," she says. "But people who don't drive don't have a choice. They risk being harassed, violated, or even killed. I may sound very dramatic, but these are all the things that happen to black people at the hands of police in Chicago." The CPD didn't provide a response to Carruthers's statements before press time. And while Donald Trump recently called for introducing New York-style stop-and-frisk policing to Chicago as a solution to our city's gun violence epidemic, Carruthers says this is already the de facto policy in communities of color, noting, for example, that the rate at which African-American pedestrians are stopped and ticketed for minor marijuana possession has been shown to be exponentially higher than that for whites. "We already have a system of targeting black and brown people as a so-called broken windows policy," Carruthers said. "It is not effective for creating the type of communities that we actually want to live in." 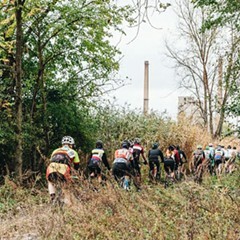 African-American, Asian-American, and Latina cyclists weigh in. They plan to lobby decision makers and possibly file a class action lawsuit. Other cities have made nonpayment on transit a fineable offense rather than a misdemeanor. Bike lanes are slated for Stony Island and other major streets leading to the park. Fining a pauper the same as a Pritzker can cause unjust economic hardship. The Vision Zero initiative brings the possibility of more encounters between police and people using the streets.